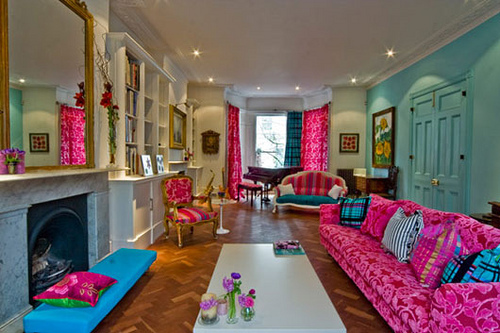 Originality and creativity are having a moment: eclectic, colorful spaces are all the rage. But though many are over matchy-matchy furniture and one-size-fits-all paint colors, some consistency throughout the home isn't a bad thing. Done right, color coordinating leads to better flow and a polished, cohesive interior design. Model-home interior designer Mary DeWalt from Austin, Texas; creates designs to appeal to buyers, and one of the ways she does does that is by maintaining color flow throughout. "For us, picking colors is all about memory," she says. "People are more likely to remember a home with a particular color scheme, because it's different from all the rest. If buyers are looking at several homes, that all-turquoise one will stand out in their minds." DeWalt's savvy color-coordinating strategies can help turn a disjointed, choppy sauce into a flowing thought-out masterpiece, as this model home design demonstrates. Pick and choose the ideas that might work for you, too. As you make your color choices, go with what you love, not just what is trendy. DeWalt suggests picking one neutral and two accent colors to carry throughout every room. Accessories provide the color in rooms with neutral walls and grouping accessories in threes keeps tabletops interesting yet clutter free. Not every room needs to include every color. Cohesion is key, but that doesn't mean you can't experiment with materials. When accessories aren't enough, add a wow factor, or what DeWalt calls a punctuation mark. Even if you love your color scheme, be cautious with big purchases. "Don't commit to large, colorful furniture, because if you get tired of the color, it is much more expensive to replace," DeWalt says. Game rooms and kids' rooms are great spaces to take chances in; consider going bold with a brightly painted ceiling. In a transitional room, such as a hallway or an entryway, don't feel the need to go big with color just a hint of your palette can be enough. Don't limit your color scheme to the interior - bring it to your pool or patio with matching tile. For those whose budget doesn't include a pool renovation (or even a pool), something as simple as colorful outdoor cushions can ensure that your outdoor and indoor spaces pair perfectly.